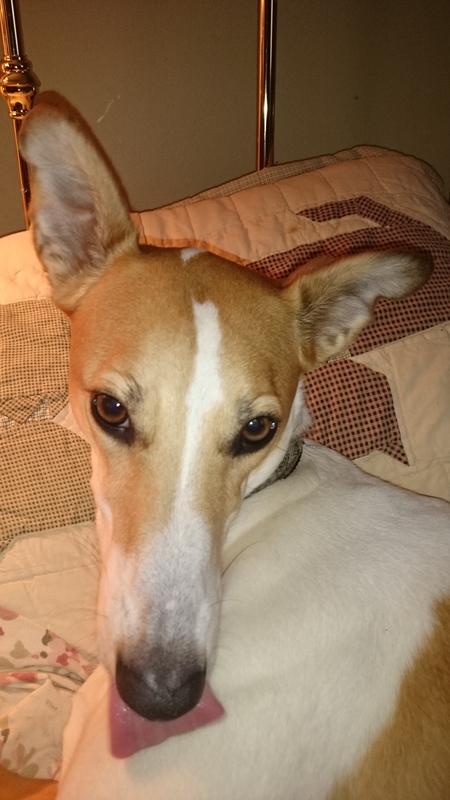 Ard Ri’s Emi Reatha Cu (Beautiful Blessing Running Big Dog) is a 2 year old Greyhound. When she was 4 months old she was advertised in Craigslist as “breed unknown”. I became her 4th (and forever) owner since she left the breeder’s at 6 weeks of age. She DNA tested as a Greyhound, so I was able to obtain an AKC Purebred Alternative Listing number for her to be entered in lure coursing competitions. She is the most intelligent and lively dog I have ever had. She patiently teaches my new rescues how to “be a dog” – play with toys, mock fight, and of course to run as fast as you can. Out of the hundreds of dogs that have gone through my home in 45 years, she is by far the one who stands out.